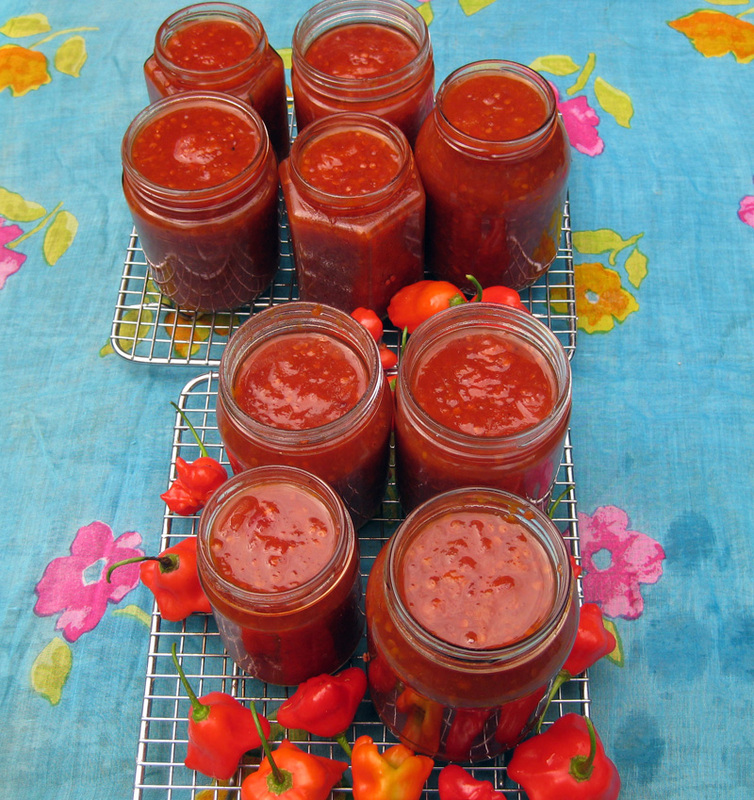 At last I have finally made the Tree Tomato ( Tamarillo ) Chutney. 3 kilos tree tomatoes, scooped out of their skins with a teaspoon. 3 large onions, garlic optional. 4 apples, peeled, cored and chunked. 2 tablespoons of grated fresh ginger or tablespoon of dried. 1 teaspoon (5 ml ) each of salt and pepper. 1 tablespoon ( 20 ml) of chilli powder or 6 bell chillies, finally chopped with seed to get the heat. 3 ( approx 750 grammes ) cups of brown or white sugar. 3 (750 ml ) of cider or white vinegar. Place and combine all ingredients into large pot or boiler. Slowly bring to the boil stirring occasionally. Once to the boil reduce heat to a gentle simmer. I place a couple of glass marbles ( my Mother taught me this ) into the pot to prevent the mixture catching. After 60 to 90 minutes and after observing the texture of the mixture turn the heat off and let stand. In the meantime prepare and sterilize the glass jars and lids. Decant mixture into jars, let cool then place lids on firmly. Ready to impress within a couple of weeks. Thanks to various chutney recipes which I combined with what I had in the larder and garden. Like the idea of adding bananas. 3 kilos with skins Murray. Thank-you for pointing this error out. Thank you for the recipe. Got some and did not know what to do with it. Will try this forsure. You won’t regret using them in a sauce or chutney. I think some people are put off tamarillos because they haven’t experienced a tree ripened one. Best wishes with your cook. I reckon dates would work well. I am making some chutney this week-end so will use a handful or two of dates. Thanks for your Mum’s recipe. I saw the honey eaters eating the ripe tamarillo’s left on the trees this morning. Neat round circles as they hover like humming birds as they eat the delicious fruit. Time to finish the harvest leaving some for the birds.